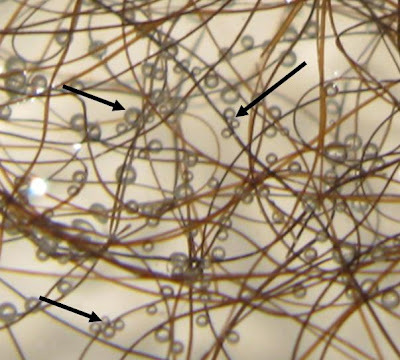 The picture shows small bubbles gathered around her hair which was left in water for 2 hours. So what could these bubbles be? 1. Could the water bubble up on its own if left for 2 hours? 2. If there were other fibres, not specifically hair, would the bubbles travel up to these? To answer these questions a new experiment is in order with 3 cups of water. 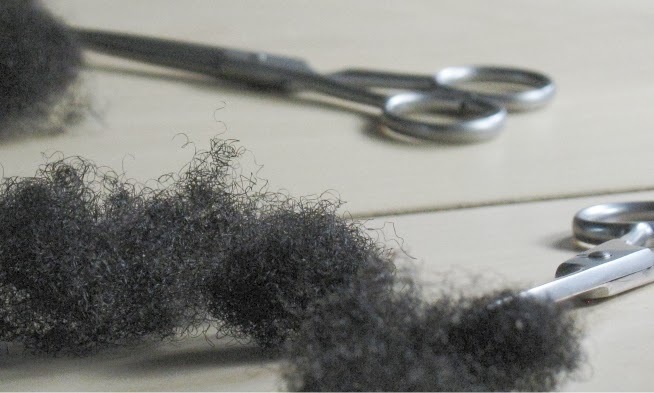 One would hold just the water, the second with hair in the water and the third with another hair like fibre but not hair - for example a few strings that would float (polyester or nylon thread maybe). I love experimenting but I am not a fan of these porosity tests mainly because they really try to oversimplify the cuticle. The hair cuticle is really so tiny......tiny tiny tiny. It takes a really sensitive machine ( if you like geekery - it is known as an atomic force microscope or AFM) to be able to estimate its separation from the cortex. When I say sensitive, this thing measures in the range of a millionth of a millimeter - think about that number, seriously, pick up a ruler, look at the distance of one millimeter. Try and divide that distance a million times. Thankfully, there is a machine for that. Now to be accurate, the cuticle is not that small, it is only two to three thousandths of a millimeter ( you can try and divide a millimeter by a thousand too........still tiny!.) However, my main point is, you cannot feel this distance without a machine. You're welcome, definitely send me the pics! Sorry to comment on an old post! Don't bubbles naturally appear in water over time? I've left cups of water alone for a while (as part of my attempt to drink more water) and bubbles usually appear. I thought this was because the water was trying to evaporate.